Do you find it a little bit odd that your little one acts so much like a cat? While they haven't yet learned to use a litter box and hopefully never will, your baby seems to have picked up some habits from your feline friends. For one, your little one has to explore everything that shows up on the floor with both their paws and mouth, just like a pet cat will. Also, you have to be worried about leaving anything breakable on your coffee table. It's sure to be pulled down by a curious paw or hand. And finally, even when you're posting your hundredth photo of your baby, you're sure that the world will thank you. Because who's a pretty kitty (er, baby)? Your baby, that's who! 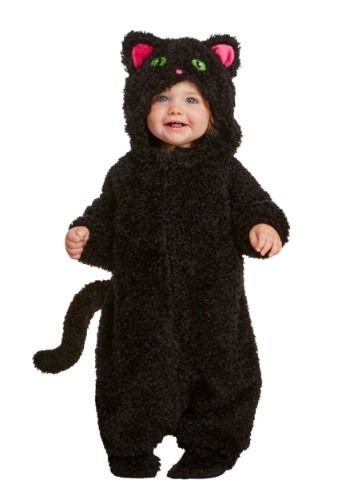 Now, whether you want your child and your cat to become closer than ever or you're simply wondering what it would be like to have a new pet around the house, this cozy kitty costume is a great option for your infant! This black suit will be super cozy for those Halloween nights. People will forget about those rumors about bad luck when they see how cozy and soft your child looks. The onesie has a tail in the back and a hood with big green eyes and hot pink lined ears. It's oversized so that you can layer clothing underneath to keep your kiddo nice and warm. This costume looks right at home at any of your Halloween get-togethers this year. Make it a family affair with a seasonal twist when mom wears a witch costume. Or dress up all your children as cats and show up with the whole family as a cat lady! Either way, with a costume as cute as this one, your little one will surely be the cat's meow!